Why would I play this? You enjoy storm combo, but are tired of ANT/TES/High Tide. You enjoy playing with Lion's Eye Diamond and killing with Tendrils of Agony. You like being able to manage your storm and mana with only two dice. Why shouldn't I play this? Decks with ponder and brainstorm offer a little more consistency. Decks with black provide you with some hand disruption. 1)	Optimized for its combo. Brainstorm/Preordain/Ponder for consistency, Ritual effects, Lotus Petal, LED for mana generation. 2)	Duress/Thoughtseize/Cabal therapy for protection. 3)	Fetch lands to help with deck manipulation and mana fixing. 4)	Black/Red for tutor + past in flames/empty the warrens. All of these are pretty rough to play against FoW decks, but you can still steal some wins and they are fun to play. IMHO they get a little boring as once you’ve mastered the lines of play there’s not a ton else to do. Somewhere in the middle is Ruby Storm (mono red storm). 1)	Mono colored deck. Ability to play lots of basic lands. 3)	Ability to play some non-basics that aren’t for consistency. (Ancient Tomb and Sandstone Needle that provide quicker kills. 4)	Raw power cards, the cards while on their own aren’t at necessarily the same power level, together have great synergies. 5)	Ability to play red cards that are typically too mana intensive for multicolored decks. What does a decklist look like? 4 Ruby Medallion: Allows you to cast multiple spells in a single turn. Makes all of the red mana acceleration extremely powerful. 4 Lion’s Eye Diamond: Great acceleration and has a lot of synergy with Past in Flames, Act on Impulse, and Burning Wish. 4 Seething Song: nets 2 mana like dark ritual, but with a Ruby Medallion it will net +3 red mana. Also can filter colorless into red mana. Pretty silly with Bonus Round, Ruby Medallion, and Hazoret's. 4 Manamorphose: Mana Fixing + Cantrip. With Ruby Medallion or Bonus Round it also functions as mana acceleration. 3 Rite of Flame: A good mana acceleration spell. Gets better with multiples and is pretty strong with Bonus Round. 1 in the sb. 4 Burning Wish: Tutors for 1R or just R with a Ruby Medallion out. With Bonus Round it can enable many turns that will end the game quickly. Allows for a SB with dedicated targets to dealing with different situations for mostly comboing off. 3 Past in Flames (1 in the sb): Yawgmoth’s Will is banned and this card is actually better in this deck (most of the time). With Ruby Medallion the cost is the same as Will and there are many times when you will cast this multiple times. Has great synergy with Lion’s Eye Diamond. 4 Act on Impulse: 3 cards for 3 mana is pretty good. 3 cards for 2 or 1 mana is borderline vintage-power level. With Bonus Round you can flip 6, or 12, or 24 (depending on how many Bonus Rounds have been cast. Can be used to play around Surgical Extraction as your win conditions can’t be hit by it when in Exile. Has a lot of synergy with Lion’s Eye Diamond. 4 Bonus Round: This is one of the cards that is a good reason to play this deck. Other storm decks can't cast this reliably, but seething song and lands like sandstone needle allow this deck to do so. Consider it another enabler of manamorphose. It is extremely good all of the instant/sorcery ramp spells and most of your sorcery cards are game over when used with this. Also worth noting that once it resolves you can cast your spells through cards like Chalice of the Void and even Trinisphere (since the copies can still ramp you). 3 Reforge the Soul: Wheel of Fortune for 3RR. Can be miracled for R. Very good against discard decks and to help a bit vs counter magic. This card is one of the reasons to play this deck. 1 Fiery Confluence: Can kill on its own with 2 Bonus Rounds or Bonus Round + Past in Flames. Gets around Leyline of Sanctity. Also can function as a sweeper and artifact killer. 6 Mountain: 10 red sources minimum, see below for other 4. 4 Ancient Tomb: Functions as a +1 ritual effect the turn you play it and can also enable turn 1 Ruby Medallion or Defense Grids. Also can start with Lotus Petal into Seething Song for some dirty turn 1 plays. 4 Sandstone Needle: Helps smooth out some draws and allows you to play draw go a bit better. Comes into play tapped is obviously not great, but providing double red twice compensates. SB: 4 Defense Grid: Flex slots, Blue Decks (noted can come down turn 1 with Ancient Tomb/RoF). SB: 2 Silent Gravestone: Protects you from surgical extraction and for those matchups also hates on snapcaster mage. Also has a draw effect which is not negligible. SB: 1 Tendrils of Agony: Wish Target, easiest way to kill with low storm counts. SB: 1 Grapeshot: Wish Target, can sweep the board and function as a win condition. Gets under Gaddock Teeg. SB: 1 Empty the Warrens: Wish Target, easy to steal games. Many people with this deck also play more maindeck as most decks can’t interact well with lots of turn 1/2 goblins. SB: 1 Reforge the Soul: Flex slot, Functions as a wheel of fortune here. SB: 1 Past in Flames: Wish Target, needed at times to combo off. SB: 1 Fiery Confluence: Flex slot, Wish Target, can also kill on its own with 2 Bonus Rounds. Gets around Leyline of Sanctity. Also can function as a sweeper and artifact killer. SB: 1 Hazoret's Undying Fury: Hail Mary if you're too fearful to wish for Reforge against blue and don't want to go for goblins. Also extremely good if you have bonus round + wish + led. (get RoF + Hazoret's, flip 8 cards and hope to hit anything (most cards are legit outs here)). SB: 1 Rite of Flame: Can be used early on (turn 2 to get an ramp spell), or to get it mid combo during a Bonus Round sequence. SB: 1 Shattering Spree: Need another artifact hate, could be a number of different cards. Potential card choices for main or sb. SB:By Force or shattering spree: Flex slot, Wish Target, good against Chalice decks. SB: Sadistic Sacrament: Flex slot, can be used against combo, in particular ANT which usually has no outs after this (assuming the card isn't in their graveyard or hand). SB: Gamble Flex slot, good interaction with Bonus Round. Can be used to grab a past in flames if you have enough mana. (not completely sold on this one in this build. got a lot worse after probe banning. SB: Goblin War Strike Flex slot, can help close out a game quicker. I'd recommend first goldfishing quite a bit. First of all, it's fun. Secondly, it's quite important to know how to sequence your spells with this deck. 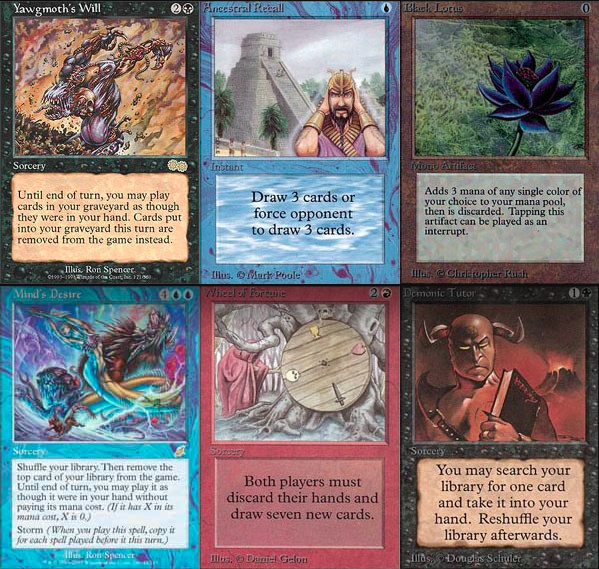 First I think the biggest issue for players with this deck is that they want to treat it like a belcher deck. What I mean by that is that players want to go off as soon as possible. While that is entirely possible (turn 1 kills are possible with this deck), you wouldn't expect TES or ANT to try to go off on turn 1 (even though they are still capable). They tend to play a little slower to sculpt their draw vs blue decks and discard cards that would be a threat. With this deck you can roughly do the same by generating more mana. For example: A deck like ANT can't really generate enough mana without thresshold to brute force their way through 2+ counterspells. TES is slightly faster, but generally there aren't enough business spells to force through. A big point I want to make is that when ANT casts past in flames, they can usually cast a few rituals and a discard spell or two, but it's quite hard to cast the cantrips as it's a lot harder to generate blue mana in those situations. With this deck, you are likely to cast all of your cantrips and act on impulses. It makes almost any past in flames a must counter, even if it doesn't look like there is anything menacing in the graveyard. Aim for somewhere around a turn 2-3 with this deck for when you first try to go off. You should also be comfortable counting mana quickly. Ancient Tomb and LED. More obvious but +1 and +3 respectively. They are generally a bit too slow here and not interactive enough on game 1. Be aware of Tabernacle and Glacial Chasm. Tendrils will kill through Chasm. Lands tends to bring in some disruption in the form of Thorn Effects, Chalice effects and sometimes Leyline of Sanctity. Occasionally there is a Trinisphere. Bring in abrades, possible a shattering spree. Bolts are less than stellar in this matchup so it's an easy swap. This matchup is a bit of a skill tester. Clock, discard, counterspells, wasteland, and bolt maindeck. If they don't hit a threat fast then just slow roll them. (which is mostly just delver). Be aware that bonus round is symmetrical so lightning bolt can deal quite a bit. (3/6/12/24). don't go crazy if they have a land open. they only play 4 force, 4 daze, x spell pierce as their main interaction with counters. This deck doesn't really have a hard time with soft counters. Just remember that if your hand is average and they have delver + force + waste + another counter, it's okay to lose. You don't have to change the decklist, that's what their deck is designed to do. That draw will beat most decks. Game 2/3. you can expect a bunch of stuff coming in. flusterstorm, surgical, marsh casualties (for gobbos), abrade, null rod, grafdigger's cage etc. i think just bringing in the usual grids + gravestones are good here, but consider removing some more bonus rounds than usual. the extra mana could be useful here. if you have a ton of this in your local meta, consider running some abrades in the sb. the discard they have on you is pretty good, but you also have 3 reforge and can easily miracle back into the game. *sometimes* these decks run stifle. if they do they can stifle the miracle trigger, storm triggers, and bonus round triggers. RUG's strategy is to play a lone threat and stall the game out with countermagic until they can deal 20. These counterspells are all problematic for Ruby Storm. Your option here is to push your way through with raw power. You can refill both players hands with reforge, but each one of your cards as you enter late stage become absolute must counters. Eventually they just run out or don't have the mana to keep up with you. In addition to the countermagic, wasteland can be strong against your Tombs and Needles. If you have a line where they are tapped out and you can pay for daze (if they have an island in play), go for it. If not, you might want to wait until you can overwhelm them in a single turn. If I can't resolve an Empty, then I try to resolve a Ruby Medallion as soon as possible. RUG delver relies a lot on its soft counters. Ruby Medallion allows you to cast your spells for less, and generate enough mana to pay for Spell Pierce and Daze easily. You generally have around 3-5 turns from when their threat was deployed, but it could be less if you are actively using Ancient Tomb. Defense Grid is very strong here. Your sweepers are also great. Thirdly, you can consider running the Scab-Clan Berserker if he's in your 75. Boil could also be a strong sb card since it only costs 2R with Ruby and can be played on their end step, which should force them to interact with you. Beware of Surgical Extraction. It can be okay to side out a Past in Flames here, possibly 2 if you think they are really pushing on the graveyard hate. Also beware of Lightning Bolts, as they become very dangerous when paired with your own Bonus Rounds. Fiery Confluence should be sided in with a Kozilek's Return. If you don't ever want to wish for Pyroclasm, side that in as well. Delvers threats die to these cards, except for goyf, which tends to get sided out in the storm matchup. Will update these over time, and will ask for some feedback from others. Miracles is a matchup where we are the favorite game 1, and I feel like the deck has a pretty fair shot of winning games 2/3. Ruby Medallion is pretty big here, as it allows you to beat their soft counters. Miracles relies on counterspells and sometimes counterbalance to keep them in the game long enough to win or stall you out with jace. Ruby Medallion makes so many cards must deal with threats that it can be overwhelming. It also allows you to jam multiple spells easily in a single turn. Past in Flames is able to keep the game going long even when the opponent has exhausted most of your spells for the first time. Because this latest version has 3 maindeck PiF and 1 sb PiF, if the spell is not dealt with game 1, it's almost always game over if you are mid to late game. Games 2 and 3 you will want to protect yourself with defense grid and silent gravestone to avoid surgical extractions. Reforge the Soul is very important for the matchup, as it allows you to refresh your hand (and theirs). Fortunately they have a limited number of ways of interaction, but all of your spells are redundant and you'll get there by brute force. Keep in mind with Ruby Medallion the miracle effect is only R.
Act on Impulse and Hazoret's are both must counter cards, but they have a bit more randomness involved so I wouldn't consider them as important. Both are great topdecks. AoI especially midgame (with a Ruby out). Last edited by mistercakes; 08-25-2018 at 02:02 PM. I think the more efficient & resilient strategy is Dark Rit -> Doomsday -> Act on Impulse or Three Wishes. Exile an LED or two, and use them to cast cards not in hand. i'm pretty sure that has nothing to do with this deck and if you're going to compare another deck, then just play ANT. It's a 6 mana Act on Impulse. It's a pretty direct comparison. I mean you can free-cast stuff, but this is like tier 5 brewing; move it to modern deck development? This is a 6 mana sorcery that lowers its own EV by having any copies of itself in the same deck. 1x it in the sideboard and Wish for it, that's about the only hope for this card getting played/sort of built-around in legacy. helm of awakening, ruby medallion, burning wish are not modern legal. rite of flame and seething song are banned. anyway, constructive criticism is welcomed, but what you mentioned is borderline trolling. A good rule to live by concerning Helm of Awakening effects is don't run them; but if you're determined to, you absolutely need to be playing P-Fire. The easiest way for big mana, mono-red to win a game of legacy is Chalice on 1 (+/- turbo Moon), and the easiest way to do that is Sol Lands...so you're making a bad Big-Red/Dragon Stompy deck that is as fragile as Belcher but also slower and with built-in nonbos. The formula the deck has to adhere to is solved, because all big mana mono-red decks are essentially "cheese" - and that's a valid strategy. It's just hard to take a list like this seriously when it has no 1-drops, huge mana, and no Chalice. 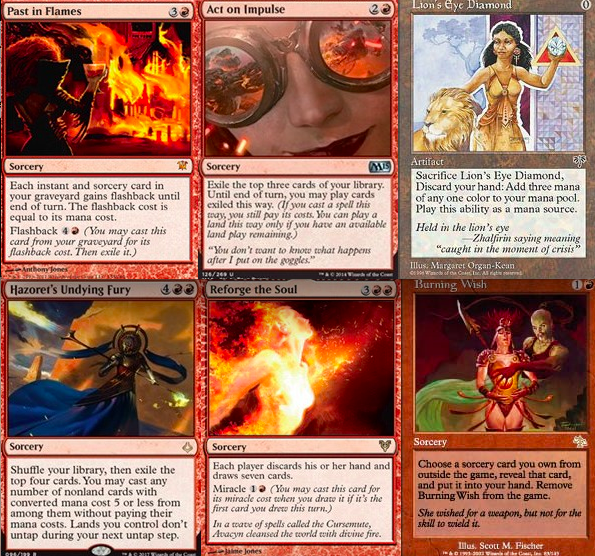 Do you want to make a Chalice on 1 Belcher-style deck or do you want to play some strange P-Fire grindy stormy thing? Either way, the 6 drop sorcery has to reside in the board - maybe you were under the impression that if its cost were reduced to 5 or less that it can free-cast itself like Mind's Desire? The cmcs of this deck are pretty outrageous, have you considered Vial Smasher or Sin Prodder? Edit: Rite of Flame, there is a one drop. the deck could certainly drop the rite of flames for 4x chalice if it's looking to get some free wins. it's definitely worse in the current configuration than the blood moon decks with regard to cheesing out a free win with a blood moon/chalice. that's totally okay. i suggest just loading it up on cockatrice for a few games just to see how it works. it's been pretty rewarding doing some solitaire. from what i've seen in the solitaire games the cc isn't so bad. i'd recommend jamming a bunch of games on there just to see how it plays out. the deck isn't as clunky as you make it seem. i also understand how the reduction in mana cost works. hitting a 2nd hazoret is fine. you are out a card, but hitting any ramp spell is huge and hitting a reforge the soul/past in flames generally means game over. if you have a past in flames in hand prior to casting and hit a reforge, you can flashback past in flames and also go off a 2nd time. some weird lines of play involve casting burning wish for R getting the past in flames and then casting the 6cc spell. obviously a huge bonus if you cut the rite of flames is that you can run chalice and you are immune to chalice. the deck would definitely then at this point want to run some sol lands. i haven't figured out a configuration for running sol lands in a deck like this. it's entirely possible a better build runs something like that. i'll have to come up with a few more drafts to see how the deck might run something like that. after doing a lot of goldfishing though, it seems like the # of business spells needs to remain around what it currently has. my main concern with running a chalice build is that if you hit a chalice with this flip 4 card, you're also out a card. you really want to just hit the red spells or reduction spells. the apes end up being 2/2's when you flip them. because of flipping the chalices, it might be better to stick to the rite of flame. It's really sad that it doesn't chain. Can you go full jank with Mizzix's Mastery? it might be okay as a 1 of or definitely a wish target. the main issue is the spell isn't in the graveyard yet if you flip it. i like the idea of casting the overload with all the ritual effects. Either way, the 6 drop sorcery has to reside in the board - maybe you were under the impression that if its cost were reduced to 5 or less that it can free-cast itself like Mind's Desire? I believe the general idea is that the cmc 6 sorcery will hit enough rituals, helms, medallions and potentially reforge the soul that you can easily just cast the second copy of the cmc 6 spell using a bunch of mana in your pool once the deck starts going which will result in self-sustaining iterations of the cmc 6 spell going bonkers. The 4th copy of the card could possibly be in the sideboard to help you keep the iterations going when flipping cmc6 into BW, but that seems like win-more since you are probably going for EtW or Grapeshot at that point and you want the extra chance of getting the first cooy of the cmc6 spell into hand -> 4MD? Yea my first draft did have 3 main 1 sb, but the deck wanted more business spells in the maindeck. You don't need to have a 2nd copy in your hand. Hitting any of the Business spells in hand or off the flip (other than flipping another 6 cc) can result in a huge chain. One thing to take note of is that if you have a reduction artifact in play, manamorphose is a ramp spell that cantrips. I still haven't thought of any other good business spells, any ideas are appreciated! the deck needed more business spells and Fox had a point about Act on Impulse. Pyromancer ascension isn't a very good draw and was only really great when hit for free. so with the reduction spell, act on impulse is either 1R draw 3 or with 2 medallions it's R draw 3. it's also a great spell to hit off of hazoret's undying fury. helps you not fizzle a lot better than pyromancer. Last edited by mistercakes; 06-29-2017 at 07:41 AM. updated. deck is still super fun to goldfish with. will try a few rounds on cockatrice to see how it goes. This is really interesting, I still think you want to at least consider Chalice here. It's free wins, it's asymmetrical, and it's protection for your combo. Fow doesn't do jack if all the cantrips are turned off. i tried chalice, but i think the deck needs actual game testing to see the value in it. goldfishing with chalice isn't so useful. once i sleeve up the deck i'll report more. the sol lands are definitely an improvement, and i might want one more mountain in the maindeck. not sure what i'd cut yet. in a few goldfish games, sometimes just using all 6 mana for the new card can lucksack through. othertimes if you hit a 1 or 2 reduction artifacts you can set yourself up for an easy following turn as well. i played 1 match vs shardless. game 1 he had double force + wasteland. game 2 i sided out the undying card b/c i forgot it wasn't legal...and it's listed as wildfire in my deck. i sided them out and stormed on turn 3 or so. game 3 he had multiple discard and i faltered on getting a red mana (he discarded my spirit guides). t3: mountain, act, rite, desperate, reforge, desperate, desperate, exile spirit guide, reforge again, seething song, exile guide, wish for ignite memories, past in flames, then i lost track of what was going on. Didn't even need the new card! Slow down over there bud! try the new version. it feels a lot better. play petal and crack, ssg mana, manamorphose (draw hazoret), city of traitors, cast hazoret. hazoret hits double ruby medallion, seething song and reforge the soul. Respond to Reforge the soul by casting seething song from hand. discard bw, draw 7: 3 land, helm, medallion, BW, Reforge the soul. Play helm for 1 (when against a real opponent, this should probably be left into exile) and medallion for free. Play Reforge the soul with RR. Discard all, draw 7: 2 land, seething song, act on impulse, BW, Past in Flames. Cast Seething Song. Manamorphose draw land. Act on impulse hits hazoret, petal, guide. cast guide just because, cast petal and crack, I have pretty much lost the count of stuff already. cast hazoret for RR. Hit helm, act on impulse, manamorphose, chandra. cast all, morphose draws desperate ritual, cast it, impulse hits 2 lands and impulse. cast impulse, hits reforge the soul, past in flames and petal. cast petal and crack, cast path in flames for R. Cast all rituals a second time, cast 3 manamorphose, cast 3 impulse. at this point there is only one card left in the deck. manamorphose from exile to draw it, uptick chandra for mana. Cast 3 Burning Wishes. Get 3x Fiery Confluence and cast them. cast path in flames. Cast the 3 Fiery Confluences a second time for lethal. Show the Burning Wish you left uncasted and the Grapeshot in the sb, make a trollface, do the knights of the hokey pokey dance. I would like to see more EtW in the SB to be boarded in against live opponents because grave hate will hurt in g2 and g3. Hitting EtW accidentally with Hazoret mid-chain seems legit in g2. I might even be tempted to run 1 copy in MD. Also, the Blood moons could be Defense Grids? Although I am not 100% sure how Helm + Grid works together, Grid can be casted t1 with sol land. We also have the option to board in Chalice @1 but I believe the Grid is much better.